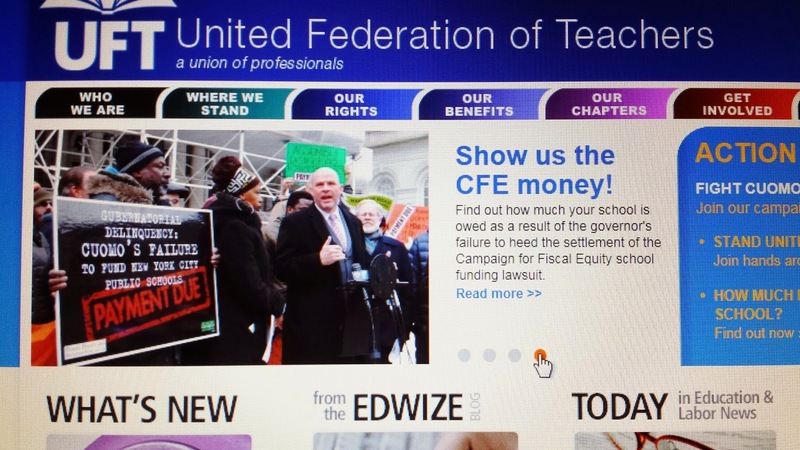 It's hard to be an optimist when the UFT seems an immovable object. Indeed, leadership practices a self-professed, peculiar form of parliamentarian rule that seems to negate democracy. It justifies 800 people voting as leadership dictates instead of heeding the rank and file, the ones whose dues pay their salaries. Still, I think the U.F.T. is a moving object, albeit very slowly. To some, it may change with all the speed of natural erosion, painfully slow. Given its traditional focus on business unionism, it sometimes seems to take the side of business-oriented principles over that of its constituency. I could mention UFT charters and ties with highly suspect persons or foundations as a starter. I regularly follow the news at ctunet.com, the website of the Chicago Teachers Union, as well uft.org, the website of the United Federation of Teachers. It seems my UFT is in a race. They just always seem behind. At times, the UFT seems to stop or stall. At other times, it picks up the pace. Sometimes, it changes course. Yet, it is always behind. And, I watch and wait and wonder when it will finally catch up on one issue, perhaps, while falling further behind on others. Both unions are busy staving off attacks from politicians funded by corporate-minded businessmen, showering millions into campaign donations as they promote the destruction of public education. In Chicago, the arch enemy is Mayor Rahm Emanuel, now fighting to maintain his power in the face of a powerful challenge by Jesus "Chuy" Garcia. The CTU is stoutly behind Garcia. In NY, Governor Andrew Cuomo is now the arch enemy. Backed by the 1%ers, he has made it his personal crusade to destroy the "public-school monopoly." It seems that by failing to do enough to try to stop him, we enabled him and with a vengeance. Both the CTU and UFT sites favor fairer funding for our public schools. 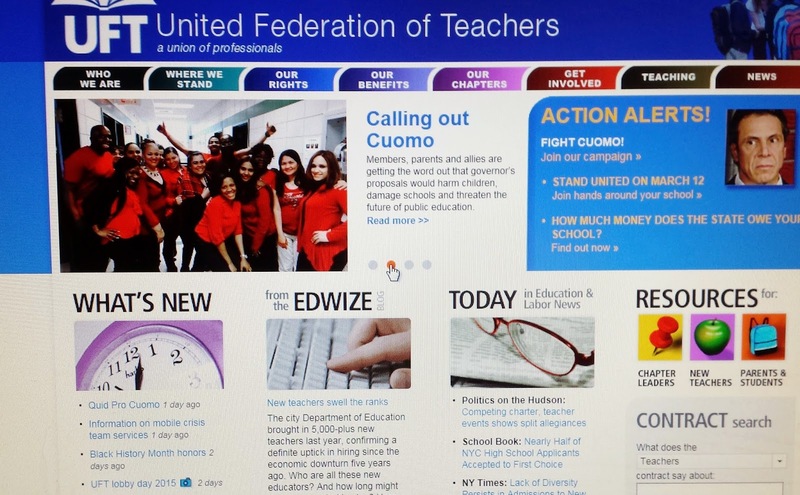 The UFT has a great link to a site which will inform you just how much money your school has lost through the Governor's reluctance to abide by the Campaign for Fiscal Equity's school-funding lawsuit. There's not much here that is not also a concern of the CTU. Both sites share concerns over class sizes. 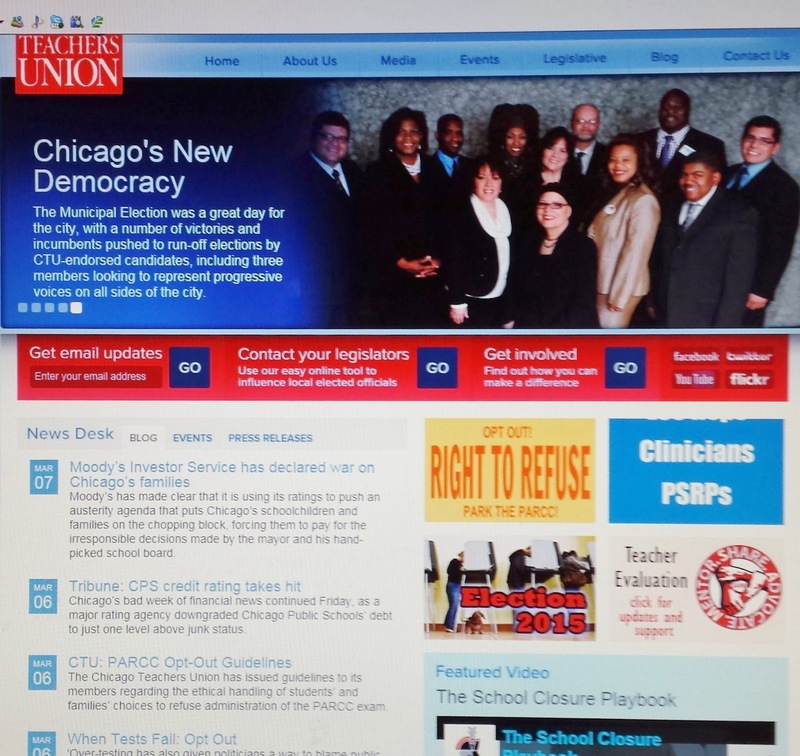 Here is a link to the CTU's discussion of the issue. Here is a link to the UFT's tax proposal to help reduce class size. At faculty conferences, we hear dire projections of more students due to crowd our already overcrowded floors next year. When I consider that an arbitrator's solution to the problem this year was excusing teachers of over-sized classes (34+ at the high-school level) from a period of professional duty, I am severely dismayed. The remedy shows a tragic misunderstanding of the nature of the problem and it bodes badly for the future. It seemed the UFT could fight a hell of a lot harder to relieve students and teachers of overcrowded learning environments. So, the UFT supports annual exams administered for diagnostic purposes only. The resolution applauds standards--which, in my mind, implies support for the Common Core. (The U.S. Chamber of Commerce must be loving them.) The resolution further applauds multiple measures of evaluation. It affirms parents' rights to opt out their children from exams. It affirms that the power of Pearson must be curbed. 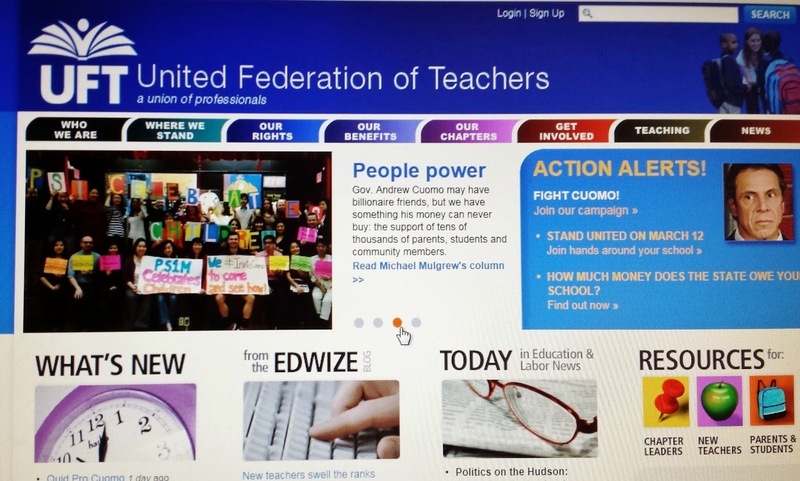 The CTU always seems several steps in advance of the UFT. The Common Core will ultimately be doomed, perhaps, even as the UFT clings to it. The national standards are intensely unpopular with those who are not paid endorsers. The question of it constitutionality may be one of its lesser worries. "that enjoins the city’s educators to growing national opposition to the Common Core State Standards, saying the assessments disrupt student learning and consume tremendous amounts of time and resources for test preparation and administration"
Both the CTU and the UFT recognize we are at war with those who would destroy public education. The UFT in the past month has taken great strides in mobilizing its membership through twitter campaigns, public forums and petitions. They have organized a week of action, culminating in teachers joining with the community in human chains about their buildings. Chicago, given the leadership of Karen Lewis, has taken far more serious actions in mobilizing its membership. The difference probably goes in part to the different situations faced by the two cities and the fact that UFT-Unity practices business unionism. CTU, under the leadership of CORE, is far more versatile. Instead of telling us that our communities want more Common-Core tests, they join with the community to overturn the system. I am guessing some day my UFT will catch up on the issue of the Core, but by then there will be new issues, and we may, once again, lag behind. It is only when your views truly reflect the views of the People that you can truly catch up. Then you have the right pulse. Then, you stand side by side, arm in arm with "People Power."